This low original mileage Series III sedan is equipped with air conditioning, power sunroof, power driver seat, power windows, power brakes, power steering, leather interior, cruise control and Sony AM/FM radio with cassette player. It has a V6 with automatic transmission and is finished in a Silver exterior with a dark blue leather interior. It has had been cared for by one Jaguar loving family since it was purchased new. This car was well taken care of, and it shows. All gauges, the radio, lights, horn and sunroof all work as they should. It comes with full instrumentation, as Jaguar is known for. The wheels, and tires are still in good shape, and it still carries its original exhaust system. The purchase of this beauty includes the matching spare tire, and jack. This is a great entry level Jaguar that allows you the comfort Jaguar is known for, with style and elegance, in an affordable model. 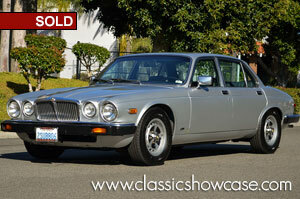 Upon its introduction in 1968, the new Jaguar XJ-6 replaced all the sedans which preceded it. The signature 4.2-liter DOHC six-cylinder engine delivered 180 hp and was matched with anti-dive suspension, power rack-and-pinion steering, power disc brakes, and either an automatic or manual 4-speed transmission with overdrive. Inside there were leather seats, walnut fascia’s, and enough gauges for a small plane. The introduction of the Series III model also saw the option of a sunroof and cruise control for the first time on an XJ model. The XJ-6 was the last Jaguar designed by company founder William Lyons, and it was a fine balance of refinement, luxury, and performance. Handling was superb for a four-door sedan.